Abstract: Surgical management with enucleation was the primary treatment for uveal melanoma (UM) for over 100 years. The Collaborative Ocular Melanoma Study confirmed in 2001 that globe-preserving episcleral brachytherapy for UM was safe and effective, demonstrating no survival difference with enucleation. Today, brachytherapy is the most common form of radiotherapy for UM. We review the history of brachytherapy in the treatment of UM and the evolution of the procedure to incorporate fine-needle-aspiration biopsy techniques with DNA- and RNA-based genetic prognostic testing. The 1970s were also a period where the desire for globe-conserving treatments that could prevent further metastasis but also preserve visual function led to the development of alternative modalities such as xenon-arc photocoagulation, argon-laser photocoagulation, transpupillary thermotherapy, proton-beam irradiation, and brachytherapy. Of all these treatment approaches, brachytherapy has become the most widely utilized conservative treatment for UM. Therefore, we focus our discussion on the history of brachytherapy in the treatment of UM, the use of fine-needle-aspiration biopsy (FNAB) as an adjunct procedure at the time of brachytherapy, and genetic prognostic information that can be obtained with the help of FNAB. Bechrakis et al reported that the first successful treatment of UM by brachytherapy was performed by Deutschmann in Hamburg in 1915.9 Hungerford reported that the first successful radiotherapy treatment of melanoma was by Moore on February 18, 1929 at Saint Bartholomew’s hospital in London.10 Moore inserted a radon seed into a melanoma in the eye. In 1948, this was a technique that Stallard was exploring for the treatment of retinoblastoma. Stallard and his physicist George Innes began inserting radon seeds into wax, positioning them on the surface of the eye, and later removing them. In the late 1960s, William Havener, an ophthalmologist at The Ohio State University with a special interest in UM, worked with Frank Batley, a radiation oncologist, to develop a ring plaque that utilized radon seeds. In 1970, Newman et al published the first paper on the treatment of posterior UM using radon seeds encapsulated in gold.11 They reported their results after treating five patients with conservative management. These techniques employed radon gas encapsulated in gold as the radiation source. Radon gas, a decay product of radium, was selected because of its availability and ease of dosage calculations.11 Dose calculations were based on the rules outlined by Paterson and Parker.12 The gold seeds filled with radon gas were uniformly distributed around the circumference of a circular mold of polyethylene tubing. Each plaque was sized to deliver 6,000–8,000 R.11 Gold seeds permitted the γ-rays from radon-decay products to penetrate the tumor while limiting the α- and β-rays that could cause local tissue necrosis.11 The tubing was then sutured to bare sclera overlying the tumor, and the Tenon’s capsule and conjunctiva were then closed in two layers. Given the short half-life of radon (3.8 days), the device was typically not removed as long as it was tolerated by the patient.11 While radon use was initially used for brachytherapy, Stallard simultaneously explored the use of cobalt 60 (60Co). Stallard’s technique evolved to the development of a 60Co radioactive scleral plaque. The technique revolutionized treatment and allowed vision to be preserved in patients with retinoblastoma.13 By 1966, Stallard was ready to report his results after treating over 100 cases of UM.14 A total of 99 of his patients were treated with 60Co-loaded circular, crescentic, or semicircular applicators that were sutured to the sclera over the neoplasm with a 1 mm margin. Most of the patients received a radiation dose of 20,000–40,000 R at the tumor base over 7–14 days.14 The optimal dose was still under trial. However, it was reported that a number of the tumors had been reduced to a flat, pigment-stippled scar. Cruess et al reported in 1984 that the “average” UM treated with 60CO-plaque therapy did not completely regress to a flat, depigmented scar, leaving concern that the remaining tumor may be viable and capable of metastasizing.15 In addition, 60Co plaques are high in energy and cannot be shielded effectively on their external surface.10 The result of this was significant radiation side effects on adjacent retina, choroid, optic nerve, lens, eyelids, and lacrimal apparatus. By 1985, cobalt plaques were no longer regularly used in London. Additional isotopes were subsequently explored for use during low-energy brachytherapy, including ruthenium 106 (106Ru) in Europe and iodine 125 (125I) in the US. Over the years, many controversies developed regarding such variables as treatment modality, tumor size and location, and radioisotopes. To address some of these controversies, the COMS group performed a nationwide, multi-institutional, randomized prospective clinical trial to compare the efficacy of enucleation vs 125I plaques for medium-sized UM. The results provided guidelines for episcleral plaque use. However, there were no standardized procedures. Therefore, the American Brachytherapy Society formed a panel to issue brachytherapy-use guidelines for the treatment of UM.38 Prior to treatment, a metastatic workup, physical exam, and ophthalmic exam (including ophthalmoscopy, ultrasound, and fundus photography) should be conducted. Uveal tumors were typically classified on the basis of thickness – small (≤3 mm), medium (>3 mm), or large (>8 mm) – with prognosis being a direct correlate with size.39 The American Joint Commission on Cancer (AJCC) released the seventh edition of cancer-staging criteria for UM in 2010, which represents the universal standard for staging using clinical, pathologic, and genetic criteria. The current edition of the AJCC staging manual uses the TNM model for anatomical staging.40 The “T category” is based on tumor basal dimension and thickness, and is divided into four increasing sizes: T1, T2, T3, and T4. It is also classified by extent of ciliary body involvement and extrascleral extension. “Node” refers to nodal involvement, with N0 (lymph-node metastasis absent) and N1 (lymph-node metastasis present). “Metastasis” refers to distant metastasis consisting of MX (cannot be assessed), M0 (distant metastasis absent), and M1 (distant metastasis present). The AJCC criteria were adopted by the American Brachytherapy Society and utilized for consensus in staging and treatment of UM. In general, small T1 UMs are difficult to distinguish from atypical choroidal nevi. Therefore, although treatment is typically offered to patients with these tumors based on several high-risk characteristics to maximize early treatment, it is also common practice to offer close, serial observation for growth prior to treatment.41–44 Medium-sized T2 UMs and large (T3 and T4) melanomas require treatment.38 In 2003, Nag et al outlined several considerations for patients who may potentially be treated by plaque brachytherapy.38 Our group’s modifications of these considerations are listed in Table 1. Chromosomal analysis of UM FNAB or formalin-fixed, paraffin-embedded specimens is clinically available.74 MLPA is used to assess abnormalities in copy numbers of chromosomes 1p, 3, 6, and 8. Microsatellite analysis is used to assess copy loss and isodisomy of chromosome 3. If findings are negative for monosomy 3 or gain of 8q, GNAQ/GNA11 mutations, which are common in UM, are evaluated to assess for presence of tumors within the FNAB sample to limit false-negative results. Mutations in SF3B1 and EIF1AX are evaluated in disomy 3 specimens. A validated online prognosticator tool has been developed that incorporates data on monosomy 3 information, as well as AJCC staging and pathologic characteristics,75 and is discussed further in the following section. A gene hunt was undertaken on chromosome 3 to identify the gene responsible for poor prognosis in monosomy 3 patients. Somatic mutation in the BAP1 gene was found in 84% of early-metastasizing (class 2) tumors.76 Subsequently, germ-line mutation in BAP1 has been shown to be part of a cancer syndrome leading to UM, cutaneous melanoma, renal cell carcinoma, and other cancers.77–81 UM patients with germ-line BAP1 mutations have significantly larger tumor diameters and a higher rate of ciliary body involvement.82 The rate of germ-line BAP1 mutation is significantly higher in metastatic UM compared to nonmetastatic UM.82 The rate of germ-line BAP1 mutation is estimated to be 22% in patients with familial UM compared to 1.6%–4% of nonfamilial UM.82–85 In patients with a family history of BAP1-related tumors, the rate of germ-line BAP1 mutation can range up to 50%.83 Germ-line mutations may be evaluated with DNA from peripheral blood or cheek swabs. Other mutations have been found to have prognostic significance. 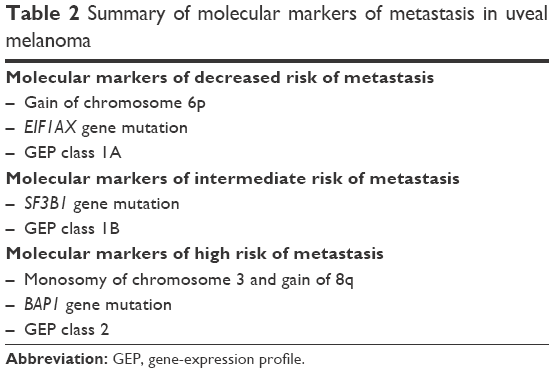 As such, SF3B1 mutation is associated with intermediate risk of metastasis and EIF1AX mutation with lowest risk of metastasis (Table 2).86–89 In patients with disomy 3, SF3B1 mutation is associated with late development of metastasis.86 While these gene mutations have significant prognostic value, there is currently no prognostic tool available for calculating risk of metastasis based on individual gene mutations. Validity of prognostic testing on FNAB samples has also been studied. UM has known heterogeneity in the tumor, and whether FNAB could adequately capture representative prognostic information was initially questioned.105 Naus et al demonstrated good reliability of FISH from FNAB sampling compared with enucleation specimens.106 However, variability in monosomy 3 status does exist within the same tumor,107,108 and variations in chromosomal copy number between the intraocular and extraocular portions of UM tumors have been reported.109 Similarly, the rate of discordance in GEP from two FNAB sample sites has been reported at 11.3%.110 However, prospective clinical trials have validated the prognostic ability of GEP on FNAB samples.91 Interestingly, Klufas et al found discordance between high-risk results from FISH and MLPA compared with GEP; 19.3% of class 1 UMs also had monosomy 3 on MLPA testing.57 Although the results of FNAB testing are excellent for prognostication, a negative test does not exclude the chance of a higher-risk tumor with absolute certainty. Some authors have suggested that obtaining FNABs from two sample sites may increase the validity of GEP results.110 However, there is a concern that the blood liberated from the first biopsy could affect the GEP results of the second biopsy, leading to inaccurate results. We currently do not advocate taking a second biopsy for GEP testing. Further work on the impact of tumor heterogeneity and discordance between GEP and MLPA results and patient outcomes would be useful. The development of DNA- and RNA-based testing has allowed for in vivo prognostic testing and use of FNAB at the time of brachytherapy. Adequate RNA and DNA can be obtained from FNAB samples for chromosomal analysis and GEP to classify tumors into high- and low-risk categories.56,68,99,101,102,104,111–113 FNAB can be performed with a transscleral or transvitreal approach depending on tumor thickness and location, and instrumentation can include use of 25–30 G needles, including custom needles, or 25–27 G vitrectors attached to flexible tubing connected to a syringe.56,101,102,104,111,112,114–116 Direct pressure with a sterile Q-tip is applied to elevate the pressure and achieve hemostasis. Intravitreal injection or vitrectomy infusion of balanced salt solution may also be used to pressurize the eye. The safety of UM FNAB has been established by several studies. Such complications as persistent hemorrhage (0–4.1%) and retinal detachment (0–1.8%) are rare, and no cases of endophthalmitis have been reported (Table 3).100–103,115 Cumulative rates of metastatic disease have not increased.103 However, histopathologic tumor seeding along the biopsy tract, and rarely cases of extraocular extension of UM after FNAB, has been reported.101,121–125 Contamination of the needle tract on histopathology has been demonstrated in up to 4% of transvitreal biopsies, causing concern for the possibility of local recurrence, since the needle-entry site is outside the field of radiation.101 Glasgow et al demonstrated a greater number of tumor cells in the aspirate tract from the direct transscleral approach compared with the indirect transvitreal approach.121 As a precaution to prevent local recurrence from tumor seeding during FNAB, we recommend keeping the biopsy site dry and treating the needle tract with cryotherapy when using a transvitreal approach. When using a transscleral approach for FNAB during brachytherapy, we recommend that the biopsy site be kept dry and the conjunctiva well retracted. We place a sterile Q-tip over the needle tract as the needle is removed, holding pressure for several seconds. The Q-tip is removed from the field. We secure the preplaced plaque sutures immediately after the FNAB pass is completed, in order to initiate rapid radiation treatment to the site. Brachytherapy has now become a standard of care as an eye-preserving treatment modality for UM. Now, genetic testing via FNAB has allowed for prognostication for patients with ocular melanoma receiving globe-sparing brachytherapy in clinical practice. Despite the improving treatment and understanding of primary UM, survival from metastatic disease remains low. Advancements in ocular screening and understanding of the genetic basis of UM will promote early detection and the development of targeted therapies that may significantly improve the prognosis of UM. This study was supported by NEI award K08EY022672. The content is solely the responsibility of the authors, and does not necessarily represent the official views of the funding NIH. Additional funds were provided by the Ohio Lions Eye Research Foundation and the Patti Blow Fund. Zakka KA, Foos RY, Omphroy CA, Straatsma BR. Malignant melanoma: analysis of an autopsy population. Ophthalmology. 1980;87(6):549–556. Mooy CM, de Jong PT. Prognostic parameters in uveal melanoma: a review. Surv Ophthalmol. 1996;41(3):215–228. Zimmerman LE, McLean IW, Foster WD. Does enucleation of the eye containing a malignant melanoma prevent or accelerate the dissemination of tumour cells. Br J Ophthalmol. 1978;62(6):420–425. Zimmerman LE, McLean IW. An evaluation of enucleation in the management of uveal melanomas. Am J Ophthalmol. 1979;87(6):741–760. Fraunfelder FT, Boozman FW, Wilson RS, Thomas AH. No-touch technique for intraocular malignant melanomas. Arch Ophthalmol. 1977;95(9):1616–1620. Manschot WA, van Strik R. Uveal melanoma: therapeutic consequences of doubling times and irradiation results: a review. Int Ophthalmol. 1992;16(2):91–99. Singh AD, Rennie IG, Kivela T, Seregard S, Grossniklaus H. The Zimmerman-McLean-Foster hypothesis: 25 years later. Br J Ophthalmol. 2004;88(7):962–967. Shields JA, Shields CL. Management of posterior uveal melanoma: past, present, and future: the 2014 Charles L. Schepens lecture. Ophthalmology. 2015;122(2):414–428. Bechrakis NE, Blatsios G, Haas G. [Short review of the history of radiotherapy for intraocular tumours]. Klin Monbl Augenheilkd. 2015;232(7):834–837. German. Hungerford JL. Current trends in the treatment of ocular melanoma by radiotherapy. Clin Exp Ophthalmol. 2003;31(1):8–13. Newman GH, Davidorf FH, Havener WH, Makley TA. Conservative management of malignant melanoma – I: irradiation as a method of treatment for malignant melanoma of the choroid. Arch Ophthalmol. 1970;83(1):21–26. Paterson R, Parker H. Radium Doseage: The Manchester System. Edinburgh: E & S Livingstone; 1947. McCartney AC, Olver JM, Kingston JE, Hungerford JL. Forty years of retinoblastoma: into the fifth age. Eye (Lond). 1988;2(Suppl):S13–S18. Stallard HB. Radiotherapy for malignant melanoma of the choroid. Br J Ophthalmol. 1966;50(3):147–155. Cruess AF, Augsburger JJ, Shields JA, Brady LW, Markoe AM, Day JL. Regression of posterior uveal melanomas following cobalt-60 plaque radiotherapy. Ophthalmology. 1984;91(12):1716–1719. Pe’er J. Ruthenium-106 brachytherapy. Dev Ophthalmol. 2012;49:27–40. Bergman L, Nilsson B, Lundell G, Lundell M, Seregard S. Ruthenium brachytherapy for uveal melanoma, 1979–2003: survival and functional outcomes in the Swedish population. Ophthalmology. 2005;112(5):834–840. Summanen P, Immonen I, Kivelä T, Tommila P, Heikkonen J, Tarkkanen A. Radiation related complications after ruthenium plaque radiotherapy of uveal melanoma. Br J Ophthalmol. 1996;80(8):732–739. Seregard S. Long-term survival after ruthenium plaque radiotherapy for uveal melanoma: a meta-analysis of studies including 1,066 patients. Acta Ophthalmol Scand. 1999;77(4):414–417. Rouberol F, Roy P, Kodjikian L, Gérard JP, Jean-Louis B, Grange JD. Survival, anatomic, and functional long-term results in choroidal and ciliary body melanoma after ruthenium brachytherapy (15 years’ experience with beta-rays). Am J Ophthalmol. 2004;137(5):893–900. Kleineidam M, Guthoff R, Bentzen SM. Rates of local control, metastasis, and overall survival in patients with posterior uveal melanomas treated with ruthenium-106 plaques. Radiother Oncol. 1993;28(2):148–156. Barker CA, Francis JH, Cohen GN, et al. 106Ru plaque brachytherapy for uveal melanoma: factors associated with local tumor recurrence. Brachytherapy. 2014;13(6):584–590. Packer S. Iodine-125 radiation of posterior uveal melanoma. Ophthalmology. 1987;94(12):1621–1626. Packer S, Fairchild RG, Salanitro P. New techniques for iodine-125 radiotherapy of intraocular tumors. Ann Ophthalmol. 1987;19(1):26–30. Hawkins BS. Collaborative ocular melanoma study randomized trial of I-125 brachytherapy. Clin Trials. 2011;8(5):661–673. Berry JL, Dandapani SV, Stevanovic M, et al. Outcomes of choroidal melanomas treated with eye physics: a 20-year review. JAMA Ophthalmol. 2013;131(11):1435–1442. Nag S, Wang D, Wu H, Bauer CJ, Chambers RB, Davidorf FH. Custom-made “Nag” eye plaques for 125I brachytherapy. Int J Radiat Oncol Biol Phys. 2003;56(5):1373–1380. Wisely CE, Hadziahmetovic M, Reem RE, et al. Long-term visual acuity outcomes in patients with uveal melanoma treated with 125I episcleral OSU-Nag plaque brachytherapy. Brachytherapy. 2016;15(1):12–22. Bell DJ, Wilson MW. Choroidal melanoma: natural history and management options. Cancer Control. 2004;11(5):296–303. Collaborative Ocular Melanoma Study Group: the Collaborative Ocular Melanoma Study (COMS) randomized trial of pre-enucleation radiation of large choroidal melanoma I: characteristics of patients enrolled and not enrolled. COMS report no. 9. Am J Ophthalmol. 1998;125(6):767–778. Jampol LM, Moy CS, Murray TG, et al. The COMS randomized trial of iodine 125 brachytherapy for choroidal melanoma: IV. Local treatment failure and enucleation in the first 5 years after brachytherapy. COMS report no. 19. Ophthalmology. 2002;109(12):2197–2206. Char DH, Castro JR, Quivey JM, et al. Uveal melanoma radiation: 125I brachytherapy versus helium ion irradiation. Ophthalmology. 1989;96(12):1708–1715. Taylor JM. Use of sources for brachytherapy. Fed Regist. 1989;54:41819–41821. Finger PT, Moshfeghi DM, Ho TK. Palladium 103 ophthalmic plaque radiotherapy. Arch Ophthalmol. 1991;109(11):1610–1613. Finger PT, Lu D, Buffa A, DeBlasio DS, Bosworth JL. Palladium-103 versus iodine-125 for ophthalmic plaque radiotherapy. Int J Radiat Oncol Biol Phys. 1993;27(4):849–854. Finger PT, Chin KJ, Duvall G. Palladium-103 ophthalmic plaque radiation therapy for choroidal melanoma: 400 treated patients. Ophthalmology. 2009;116(4):790.e1–796.e1. Finger PT, Berson A, Ng T, Szechter A. Palladium-103 plaque radiotherapy for choroidal melanoma: an 11-year study. Int J Radiat Oncol Biol Phys. 2002;54(5):1438–1445. Nag S, Quivey JM, Earle JD, et al. 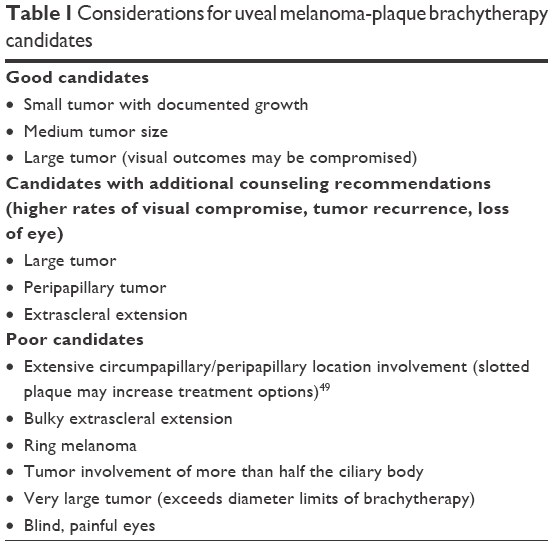 The American Brachytherapy Society recommendations for brachytherapy of uveal melanomas. Int J Radiat Oncol Biol Phys. 2003;56(2):544–555. Shields CL, Furuta M, Thangappan A, et al. Metastasis of uveal melanoma millimeter-by-millimeter in 8033 consecutive eyes. Arch Ophthalmol. 2009;127(8):989–998. Mellen PL, Morton SJ, Shields CL. American Joint Committee on Cancer staging of uveal melanoma. Oman J Ophthalmol. 2013;6(2):116–118. Collaborative Ocular Melanoma Study Group. Factors predictive of growth and treatment of small choroidal melanoma: COMS report no. 5. Arch Ophthalmol. 1997;115(12):1537–1544. Murray TG. Small choroidal melanoma. Arch Ophthalmol. 1997;115(12):1577–1578. Augsburger JJ. Is observation really appropriate for small choroidal melanomas. Trans Am Ophthalmol Soc. 1993;91:147–175. Shields CL, Demirci H, Materin MA, Marr BP, Mashayekhi A, Shields JA. Clinical factors in the identification of small choroidal melanoma. Can J Ophthalmol. 2004;39(4):351–357. Muen WJ, Damato BE. Uveal malignant melanoma with extrascleral extension, treated with plaque radiotherapy. Eye (Lond). 2007;21(2):307–308. Shields CL, Naseripour M, Cater J, et al. Plaque radiotherapy for large posterior uveal melanomas (≥ 8 mm thick) in 354 consecutive patients. Ophthalmology. 2002;109(10):1838–1849. Sagoo MS, Shields CL, Emrich J, Mashayekhi A, Komarnicky L, Shields JA. Plaque radiotherapy for juxtapapillary choroidal melanoma: treatment complications and visual outcomes in 650 consecutive cases. JAMA Ophthalmol. 2014;132(6):697–702. Sagoo MS, Shields CL, Mashayekhi A, et al. Plaque radiotherapy for choroidal melanoma encircling the optic disc (circumpapillary choroidal melanoma). Arch Ophthalmol. 2007;125(9):1202–1209. Finger PT, Chin KJ, Tena LB. A five-year study of slotted eye plaque radiation therapy for choroidal melanoma: near, touching, or surrounding the optic nerve. Ophthalmology. 2012;119(2):415–422. Damato BE. Treatment selection for uveal melanoma. Dev Ophthalmol. 2012;49:16–26. Lane AM, Kim IK, Gragoudas ES. Proton irradiation for peripapillary and parapapillary melanomas. Arch Ophthalmol. 2011;129(9):1127–1130. American Brachytherapy Society Ophthalmic Oncology Task Force. The American Brachytherapy Society consensus guidelines for plaque brachytherapy of uveal melanoma and retinoblastoma. Brachytherapy. 2014;13(1):S447. Baloch ZW, LiVolsi VA, Asa SL, et al. Diagnostic terminology and morphologic criteria for cytologic diagnosis of thyroid lesions: a synopsis of the National Cancer Institute Thyroid Fine-Needle Aspiration State of the Science Conference. Diagn Cytopathol. 2008;36(6):425–437. Bruix J, Sherman M. Management of hepatocellular carcinoma: an update. Hepatology. 2011;53(3):1020–1022. Plasseraud KM, Cook RW, Tsai T, et al. Clinical performance and management outcomes with the DecisionDx-UM gene expression profile test in a prospective multicenter study. J Oncol. 2016;2016:5325762. Onken MD, Worley LA, Dávila RM, Char DH, Harbour JW. Prognostic testing in uveal melanoma by transcriptomic profiling of fine needle biopsy specimens. J Mol Diagn. 2006;8(5):567–573. Klufas MA, Richter E, Itty S, et al. Comparison of gene expression profiling and chromosome 3 analysis by fluorescent in situ hybridization and multiplex ligation probe amplification in fine-needle aspiration biopsy specimens of uveal melanoma. Ocul Oncol Pathol. 2018;4(1):16–20. Cook SA, Damato B, Marshall E, Salmon P. Psychological aspects of cytogenetic testing of uveal melanoma: preliminary findings and directions for future research. Eye (Lond). 2009;23(3):581–585. Damato B, Coupland SE. A reappraisal of the significance of largest basal diameter of posterior uveal melanoma. Eye (Lond). 2009;23(12):2152–2162. Damato B, Coupland SE. Translating uveal melanoma cytogenetics into clinical care. Arch Ophthalmol. 2009;127(4):423–429. Damato B, Dopierala J, Klaasen A, van Dijk M, Sibbring J, Coupland SE. Multiplex ligation-dependent probe amplification of uveal melanoma: correlation with metastatic death. Invest Ophthalmol Vis Sci. 2009;50(7):3048–3055. Onken MD, Worley LA, Ehlers JP, Harbour JW. Gene expression profiling in uveal melanoma reveals two molecular classes and predicts metastatic death. Cancer Res. 2004;64(20):7205–7209. Prescher G, Bornfeld N, Hirche H, Horsthemke B, Jöckel KH, Becher R. Prognostic implications of monosomy 3 in uveal melanoma. Lancet. 1996;347(9010):1222–1225. Sisley K, Rennie IG, Parsons MA, et al. Abnormalities of chromosomes 3 and 8 in posterior uveal melanoma correlate with prognosis. Genes Chromosomes Cancer. 1997;19(1):22–28. Ewens KG, Kanetsky PA, Richards-Yutz J, et al. Genomic profile of 320 uveal melanoma cases: chromosome 8p-loss and metastatic outcome. Invest Ophthalmol Vis Sci. 2013;54(8):5721–5729. Singh AD, Tubbs R, Biscotti C, Schoenfield L, Trizzoi P. Chromosomal 3 and 8 status within hepatic metastasis of uveal melanoma. Arch Pathol Lab Med. 2009;133(8):1223–1227. Chang MY, Rao NP, Burgess BL, Johnson L, McCannel TA. Heterogeneity of monosomy 3 in fine needle aspiration biopsy of choroidal melanoma. Mol Vis. 2013;19:1892–1900. Shields CL, Ganguly A, Bianciotto CG, Turaka K, Tavallali A, Shields JA. Prognosis of uveal melanoma in 500 cases using genetic testing of fine-needle aspiration biopsy specimens. Ophthalmology. 2011;118(2):396–401. Onken MD, Worley LA, Person E, Char DH, Bowcock AM, Harbour JW. Loss of heterozygosity of chromosome 3 detected with single nucleotide polymorphisms is superior to monosomy 3 for predicting metastasis in uveal melanoma. Clin Cancer Res. 2007;13(10):2923–2927. Damato B, Duke C, Coupland SE, et al. Cytogenetics of uveal melanoma: a 7-year clinical experience. Ophthalmology. 2007;114(10):1925–1931. Damato B, Dopierala JA, Coupland SE. Genotypic profiling of 452 choroidal melanomas with multiplex ligation-dependent probe amplification. Clin Cancer Res. 2010;16(24):6083–6092. McNamara M, Felix C, Davison EV, Fenton M, Kennedy SM. Assessment of chromosome 3 copy number in ocular melanoma using fluorescence in situ hybridization. Cancer Genet Cytogenet. 1997;98(1):4–8. Tschentscher F, Prescher G, Zeschnigk M, Horsthemke B, Lohmann DR. Identification of chromosomes 3, 6, and 8 aberrations in uveal melanoma by microsatellite analysis in comparison to comparative genomic hybridization. Cancer Genet Cytogenet. 2000;122(1):13–17. Chattopadhyay C, Kim DW, Gombos DS, et al. Uveal melanoma: from diagnosis to treatment and the science in between. Cancer. 2016;122(15):2299–2312. DeParis SW, Taktak A, Eleuteri A, et al. External validation of the liverpool uveal melanoma prognosticator online. Invest Ophthalmol Vis Sci. 2016;57(14):6116–6122. Harbour JW, Onken MD, Roberson ED, et al. Frequent mutation of BAP1 in metastasizing uveal melanomas. Science. 2010;330(6009):1410–1413. Abdel-Rahman MH, Pilarski R, Cebulla CM, et al. Germline BAP1 mutation predisposes to uveal melanoma, lung adenocarcinoma, meningioma, and other cancers. J Med Genet. 2011;48(12):856–859. Popova T, Hebert L, Jacquemin V, et al. Germline BAP1 mutations predispose to renal cell carcinomas. Am J Hum Genet. 2013;92(6):974–980. Wiesner T, Obenauf AC, Murali R, et al. Germline mutations in BAP1 predispose to melanocytic tumors. Nat Genet. 2011;43(10):1018–1021. Testa JR, Cheung M, Pei J, et al. Germline BAP1 mutations predispose to malignant mesothelioma. Nat Genet. 2011;43(10):1022–1025. Rai K, Pilarski R, Cebulla CM, Abdel-Rahman MH. Comprehensive review of BAP1 tumor predisposition syndrome with report of two new cases. Clin Genet. 2016;89(3):285–294. Njauw CN, Kim I, Piris A, et al. Germline BAP1 inactivation is preferentially associated with metastatic ocular melanoma and cutaneous-ocular melanoma families. PLoS One. 2012;7(4):e35295. Rai K, Pilarski R, Boru G, et al. Germline BAP1 alterations in familial uveal melanoma. Genes Chromosomes Cancer. 2017;56(2):168–174. Gupta MP, Lane AM, DeAngelis MM, et al. Clinical characteristics of uveal melanoma in patients with germline BAP1 mutations. JAMA Ophthalmol. 2015;133(8):881–887. Aoude LG, Vajdic CM, Kricker A, Armstrong B, Hayward NK. Prevalence of germline BAP1 mutation in a population-based sample of uveal melanoma cases. Pigment Cell Melanoma Res. 2013;26(2):278–279. Yavuzyigitoglu S, Koopmans AE, Verdijk RM, et al. Uveal melanomas with SF3B1 mutations: a distinct subclass associated with late-onset metastases. Ophthalmology. 2016;123(5):1118–1128. Field MG, Harbour JW. Recent developments in prognostic and predictive testing in uveal melanoma. Curr Opin Ophthalmol. 2014;25(3):234–239. Harbour JW, Roberson ED, Anbunathan H, Onken MD, Worley LA, Bowcock AM. Recurrent mutations at codon 625 of the splicing factor SF3B1 in uveal melanoma. Nat Genet. 2013;45(2):133–135. Martin M, Masshöfer L, Temming P, et al. Exome sequencing identifies recurrent somatic mutations in EIF1AX and SF3B1 in uveal melanoma with disomy 3. Nat Genet. 2013;45(8):933–936. Worley LA, Onken MD, Person E, et al. Transcriptomic versus chromosomal prognostic markers and clinical outcome in uveal melanoma. Clin Cancer Res. 2007;13(5):1466–1471. Onken MD, Worley LA, Char DH, et al. Collaborative Ocular Oncology Group report number 1: prospective validation of a multi-gene prognostic assay in uveal melanoma. Ophthalmology. 2012;119(8):1596–1603. Landreville S, Agapova OA, Harbour JW. Emerging insights into the molecular pathogenesis of uveal melanoma. Future Oncol. 2008;4(5):629–636. Onken MD, Worley LA, Tuscan MD, Harbour JW. An accurate, clinically feasible multi-gene expression assay for predicting metastasis in uveal melanoma. J Mol Diagn. 2010;12(4):461–468. Field MG, Decatur CL, Kurtenbach S, et al. PRAME as an independent biomarker for metastasis in uveal melanoma. Clin Cancer Res. 2016;22(5):1234–1242. Gezgin G, Luk SJ, Cao J, et al. PRAME as a potential target for immunotherapy in metastatic uveal melanoma. JAMA Ophthalmol. 2017;135(6):541–549. Walter SD, Chao DL, Feuer W, Schiffman J, Char DH, Harbour JW. Prognostic implications of tumor diameter in association with gene expression profile for uveal melanoma. JAMA Ophthalmol. 2016;134(7):734–740. Corrêa ZM, Augsburger JJ. Independent prognostic significance of gene expression profile class and largest basal diameter of posterior uveal melanomas. Am J Ophthalmol. 2016;162:20.e1–27.e1. Eleuteri A, Damato B, Coupland SE, Taktak AF. Enhancing survival prognostication in patients with choroidal melanoma by integrating pathologic, clinical and genetic predictors of metastasis. Int J Biomed Eng Technol. 2012;8(1):18–35. Shields CL, Ganguly A, Materin MA, et al. Chromosome 3 analysis of uveal melanoma using fine-needle aspiration biopsy at the time of plaque radiotherapy in 140 consecutive cases. Trans Am Ophthalmol Soc. 2007;105:43–53. Midena E, Bonaldi L, Parrozzani R, Radin PP, Boccassini B, Vujosevic S. In vivo monosomy 3 detection of posterior uveal melanoma: 3-year follow-up. Graefes Arch Clin Exp Ophthalmol. 2008;246(4):609–614. Singh AD, Medina CA, Singh N, Aronow ME, Biscotti CV, Triozzi PL. Fine-needle aspiration biopsy of uveal melanoma: outcomes and complications. Br J Ophthalmol. 2016;100(4):456–462. Sellam A, Desjardins L, Barnhill R, et al. Fine needle aspiration biopsy in uveal melanoma: technique, complications, and outcomes. Am J Ophthalmol. 2016;162:28.e1–34.e1. McCannel TA, Chang MY, Burgess BL. Multi-year follow-up of fine-needle aspiration biopsy in choroidal melanoma. Ophthalmology. 2012;119(3):606–610. Correa ZM, Augsburger JJ. Sufficiency of FNAB aspirates of posterior uveal melanoma for cytologic versus GEP classification in 159 patients, and relative prognostic significance of these classifications. Graefes Arch Clin Exp Ophthalmol. 2014;252(1):131–135. Folberg R, Augsburger JJ, Gamel JW, Shields JA, Lang WR. Fine-needle aspirates of uveal melanomas and prognosis. Am J Ophthalmol. 1985;100(5):654–657. Naus NC, Verhoeven AC, van Drunen E, et al. Detection of genetic prognostic markers in uveal melanoma biopsies using fluorescence in situ hybridization. Clin Cancer Res. 2002;8(2):534–539. Schoenfield L, Pettay J, Tubbs RR, Singh AD. Variation of monosomy 3 status within uveal melanoma. Arch Pathol Lab Med. 2009;133(8):1219–1222. Maat W, Jordanova ES, van Zelderen-Bhola SL, et al. The heterogeneous distribution of monosomy 3 in uveal melanomas: implications for prognostication based on fine-needle aspiration biopsies. Arch Pathol Lab Med. 2007;131(1):91–96. Lake SL, Damato BE, Dopierala J, Baudo MM, Taktak AF, Coupland SE. Multiplex ligation-dependent probe amplification analysis of uveal melanoma with extraocular extension demonstrates heterogeneity of gross chromosomal abnormalities. Invest Ophthalmol Vis Sci. 2011;52(8):5559–5564. Augsburger JJ, Corrêa ZM, Augsburger BD. Frequency and implications of discordant gene expression profile class in posterior uveal melanomas sampled by fine needle aspiration biopsy. Am J Ophthalmol. 2015;159(2):248–256. Chang MY, McCannel TA. Comparison of uveal melanoma cytopathologic sample retrieval in trans-scleral versus vitrectomy-assisted transvitreal fine needle aspiration biopsy. Br J Ophthalmol. 2014;98(12):1654–1658. Sisley K, Nichols C, Parsons MA, Farr R, Rees RC, Rennie IG. Clinical applications of chromosome analysis, from fine needle aspiration biopsies, of posterior uveal melanomas. Eye (Lond). 1998;12(Pt 2):203–207. Char DH, Kroll SM, Miller T, Castro J, Quivey J. Irradiated uveal melanomas: cytopathologic correlation with prognosis. Am J Ophthalmol. 1996;122(4):509–513. Pelayes DE, Zarate JO, Biscotti CV, Singh AD. Calibrated needle for ophthalmic fine needle aspiration biopsy. Br J Ophthalmol. 2012;96(8):1147–1148. Augsburger JJ, Shields JA. Fine needle aspiration biopsy of solid intraocular tumors: indications, instrumentation and techniques. Ophthalmic Surg. 1984;15(1):34–40. Midena E, Bonaldi L, Parrozzani R, Tebaldi E, Boccassini B, Vujosevic S. In vivo detection of monosomy 3 in eyes with medium-sized uveal melanoma using transscleral fine needle aspiration biopsy. Eur J Ophthalmol. 2006;16(3):422–425. Klufas MA, Itty S, McCannel CA, Glasgow BJ, Moreno C, McCannel TA. Variable results for uveal melanoma-specific gene expression profile prognostic test in choroidal metastasis. JAMA Ophthalmol. 2015;133(9):1073–1076. Gold AS, Murray TG, Markoe AM, et al. Uveal melanoma gene expression status post radiotherapy. Optom Vis Sci. 2014;91(1):e14–e17. Wackernagel W, Tarmann L, Mayer C, Langmann G, Wedrich A. Genetic analysis of uveal melanoma by array comparative genomic hybridization before and after radiotherapy. Spektrum Augenheilkd. 2013;27:286–291. Dogrusöz M, Kroes WG, van Duinen SG, et al. Radiation treatment affects chromosome testing in uveal melanoma. Invest Ophthalmol Vis Sci. 2015;56(10):5956–5964. Glasgow BJ, Brown HH, Zargoza AM, Foos RY. Quantitation of tumor seeding from fine needle aspiration of ocular melanomas. Am J Ophthalmol. 1988;105(5):538–546. Kim RS, Chevez-Barrios P, Bretana ME, Wong TP, Teh BS, Schefler AC. Histopathologic analysis of transvitreal fine needle aspiration biopsy needle tracts for uveal melanoma. Am J Ophthalmol. 2017;174:9–16. Mashayekhi A, Lim RP, Shields CL, Eagle RC Jr, Shields JA. Extraocular extension of ciliochoroidal melanoma after transscleral fine-needle aspiration biopsy. Retin Cases Brief Rep. 2016;10(3):289–292. Schefler AC, Gologorsky D, Marr BP, Shields CL, Zeolite I, Abramson DH. Extraocular extension of uveal melanoma after fine-needle aspiration, vitrectomy, and open biopsy. JAMA Ophthalmol. 2013;131(9):1220–1224. Caminal JM, Sanz S, Carreras M, Catala I, Arruga J, Roca G. Epibulbar seeding at the site of a transvitreal fine-needle aspiration biopsy. Arch Ophthalmol. 2006;124(4):587–589. Kiratli H, Koç I, Tarlan B. Orbital extension of an unsuspected choroidal melanoma presumably through an aqueous tube shunt. Ocul Oncol Pathol. 2016;2(3):144–147.